Care Inspectorate Resource pack and project at 'The Haining' Care Home. You can watch a video that tracks the project at The Haining Care home, near Falkirk. 2013 - present Engage and Engage Scotland National and Regional Rep for Freelance Artists2014 -2017 2014 President of Scottish Artists Union. 2015 Paying Artists Regional Advocate for A-N / AIR. (GLASGOW). 2001- present Freelance Artist, working on a variety of projects, residencies and commissions. Nov. ‘07 –’08 Artist In Residence (Digital Media), Callendar House, Callendar Park, Falkirk. May ’01 - Aug.’01 Exhibition Coordinator, Street Level Photoworks, Glasgow. Aug.’99 - May ’01 Gallery Manager, Street Level Photoworks, Glasgow. 1997 - ‘99 Part- time Lecturer, Painting Department, Edinburgh College of Art. 1995 - ‘98 Gallery Assistant, Glasgow Print Studio. 1992 - ‘99 Art tutor for a variety of projects and organisations. ​2016 Luminate IPad Project, for Alzheimers Scotland, with Douglas Moreland. Arts In Care Project, at The Haining, Falkirk, for the Care Inspectorate - Arts & Health DVD to be distributed to all Care Homes in Scotland. ‘Moving On- Moving’ Artists Residency at Blythewood Care Home, Inverurie. 2014 GCC Social Work Dalness Care Home Project. Bridgeton Cross Memories Project, for Clyde Gateway, lead artist. 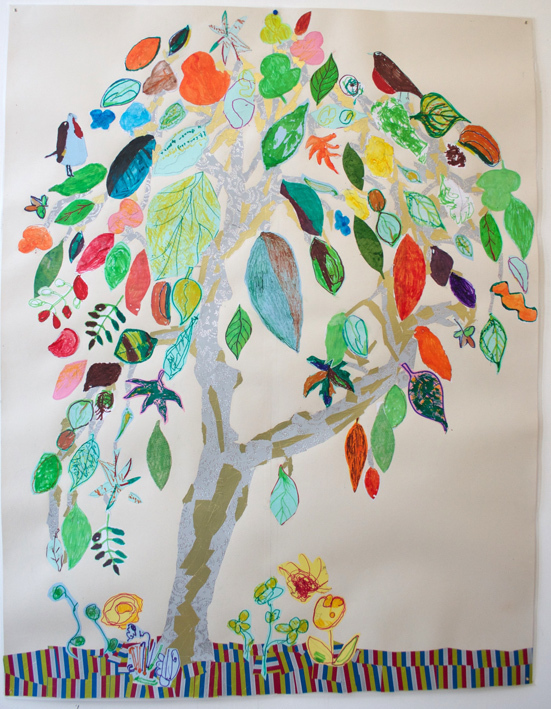 Collage project with GAMH Carers group. 'Moving On- Moving In', Edenhome Care Home Commission, Stonehaven, Aberdeenshire. 2012 South Lanarkshire Design Project with Holy Cross High School, Hamilton. Gallowgate Artworks Project, with Thenue Residents Association, Calton. Streetland Flags Project with Dixon Daycare Residents Group and Ethnic Minority Group. GCC Care Leavers Project, Project to create Lightbox images for the Martyr’s School building. Mortlach Story Walks Commission, Dufftown, near Huntly, artworks, leaflets & signage with Mortlach Primary School. Aye Write collaborative Project with AIS, GEAAP Easterhouse and writer John Binnie. Village Voice Magazine & Calendar project, for Falkirk Council. Flags for the Big Day Oot, Fun Run with GAMH and Dalmarock Youth Group. Commonwealth project, public artworks for Citadel Swimming Pool, Ayr. The Comet Project, Public Artwork for Port Glasgow in collaboration with schoolchildren & residents..
Workshop to develop summary version of Integrated Services Plan with Young Carers, North Lanarkshire Council. Friends of Calton Weavers Project, and St James Primary School, Calton, Glasgow. Creative Communities, B.A.S.I.S. 09 (Barrhead Art and Social Inclusion Strategy) for Art In Partnership, and D-Arts Barrhead and Causeway. Suffragettes Project with Falkirk Council and WEA, to make Banners for the Re-enactment procession. Fracture Digital media project, for South Lanarkshire, working with teenagers from Rathbone and Princes Trust. Art Beat Project, Creative Therapies and East Dumbartonshire for vulnerable young people affected by drug or alcohol misuse. ‘Identity & Image’ Digital photography workshops for adults and teenagers for GOMA, Glasgow, during Jo Spence exhibition. Digital photography workshops for Kelvingrove Art Galleries, Glasgow during Harry Benson exhibition. “Double Act, A Creative Conversation” Collaboration with Special needs Artist Tommy Mason; Projectability, Glasgow. Brannock High School, North Lanarkshire, Poster project with the ‘Making A Difference’ group. B.A.S.I.S. 3 (Barrhead Art and Social Inclusion Strategy) with Art In Partnership, with Neilston Youth Initiative, creation of Posters and lightboxes. Flanders Moss Project, for Scottish Natural Heritage, Thornhill Primary School near Stirling. Lead Artist, 16 Days of Action to Eradicate Violence Against Women, Glasgow City Council. Project with Aberlour No.1, Routes into Learning, Scottish Refugee Council Women’s Group, Oasis Women’s Group, Wayside Women’s Group, Royston RING Group, Heimat Gryffe Women’s Aid, SAY Women, Hyndland Secondary School. Carinish Primary School, Benbecula Workshops to create Artworks for exterior of the School. Easter Environmental Digital Photography Project, Benbecula, Western Isles, with teenagers. “I Love Carlowrie”, Digital Photography and Arts Project, Carlowrie Park, Blantyre, involving the local community to make artworks for the TACT Community Hall and Carlowrie Park. B.A.S.I.S. (Barrhead Art and Social Inclusion Strategy) with Art In Partnership, Neilston Arts Project with Neilston Youth Initiative, to make poster artworks and digital animation. Govan Arts Project at Bellahouston Academy and Govan High School, for Keeping Well, Glasgow, to make artworks in the form of lightboxes for the Pearce Institute, Govan. Scottish National Portrait Gallery, Picture Yourself. Digital Portraits. Rule Of Thumb: Contemporary Art and Human Rights, Education Project, Gallery of Modern Art, Glasgow, with SAY Women and the Young Women’s Project, to make a 12 minute video, in collaboration with Video artist Alex Hetherington. Chatelherault Country Park, Visual Arts Residency, South Lanarkshire Council. East Kilbride Shopping Centre and ‘Art and Kids’ Art and Illustration Project for 8 Primary Schools, Lead Artist and Coordinator. Environmental Photography Project, Benbecula, North & South Uist, Western Isles, with teenagers creating lighboxes for Benbecula Airport. Crossingpoints Project with Edinburgh Primary and Secondary Schools, through the Cockburn Association, Edinburgh, collaborating with Architects and Story Tellers. School Leavers Digital Photography Project, Canonmills School, Edinburgh, (Special School for Excluded Children). National Galleries of Scotland Education Department, Titian Workshops, - Digital Imaging Workshops for Schools, Playfair Education Resource, Edinburgh. Lauderdale Park Project, to create artworks in the form of signage for Lauderdale Park, Hyndland, Glasgow in collaboration with pupils from Hyndland P.S., Notre Dame P.S., Hyndland Secondary School and Notre Dame High School. Donaldsons School for the Deaf, Edinburgh, project to create an artwork for the Primary School entrance. Drylaw Artworks, 6 Artists’ Projects to produce artworks for Drylaw Shopping Centre, North Edinburgh. Winner of an Engage Award 2005. Window In the World Project, Holycross High School, Hamilton & Holyrood Secondary School, Glasgow. Burnbank Photography Project for South Lanarkshire Council, Glenlee P.S. & St. Cuthberts P.S. to produce artworks for the Burnbank Centre. Elmvale Murals Project through North Glasgow College, Community Education Dept. National Galleries Educational Outreach Project “Parallel Lives”, Muirhouse, Edinburgh. Banners For Biggar, Digital Art Project, 1st year pupils, Biggar High School, South Lanarkshire. Art in Hospitals/ Art Dans La Cite, Artist Residency, Yorkhill Hospital For Sick Kids, Glasgow, creating lightboxes for the Outpatients Department. National Galleries of Scotland Educational Outreach Project, “A Wealth of Vision”, Artist-led project, working with teenagers from RightTrack, Drumchapel, Glasgow. Scottish Natural Heritage, Young People’s Art Project, (Marine Environment), Artist-led project with teenagers from St. Abbs and Eyemouth, to create banners for St Abbs Visitor Centre and flags for the Drydock Youth Club. Digital Imaging workshops with One Plus (Single Parents group), for Street Level Gallery.